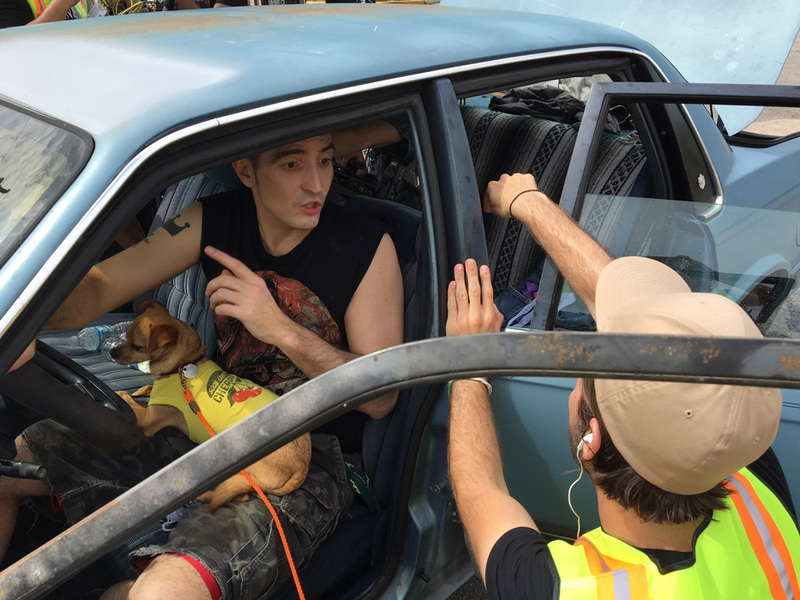 All Creatures Here Below lead actor and screenwriter David Dastmalchian (left) speaks with the film’s director, Collin Schiffli, during a car scene shoot in Kansas City. Photo by Amy Greene. KC Film Office film & media manager Steph Scupham (right) visited with actor David Koechner (left) and producer, Amy Greene, on the set of All Creatures Here Below, during filming inside Mamma Leone's Pizza in Kansas City. Photo by Jim Barcus. 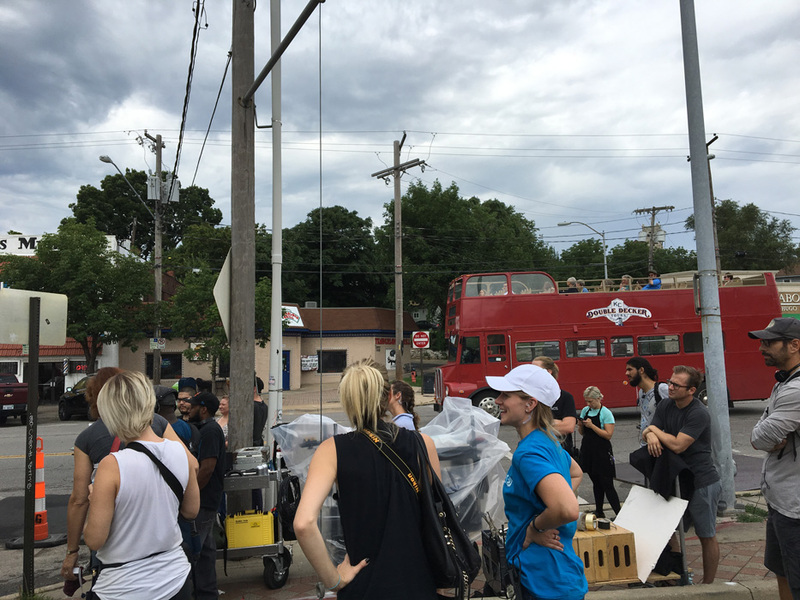 The crew of All Creatures Here Below, a film written by and starring Overland Park native David Dastmalchian, assembled at the set during exterior filming in Kansas City. Many of the crew members were Kansas City hires. Photo by Amy Greene. 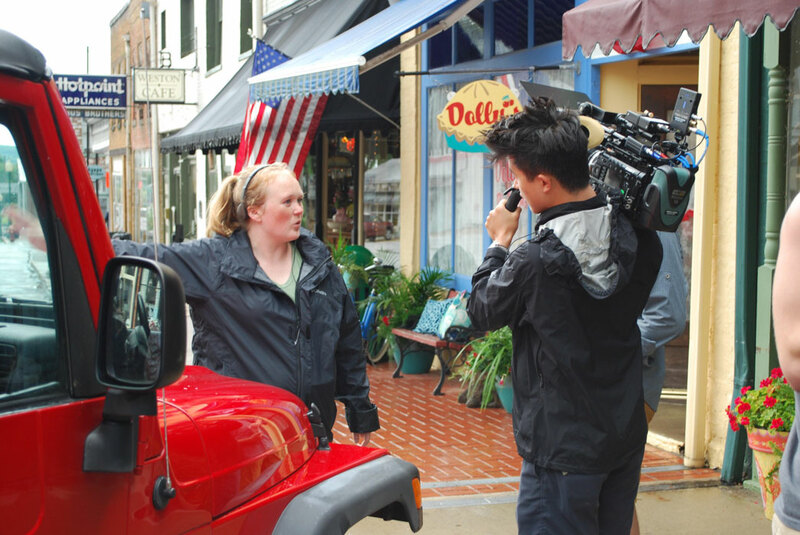 Director Morgan Dameron and camera operator Dan Chen shoot outside Dolly's, a diner fashioned in Kansas City for Dameron’s upcoming film, Different Flowers. Photo by Natalie Dameron. 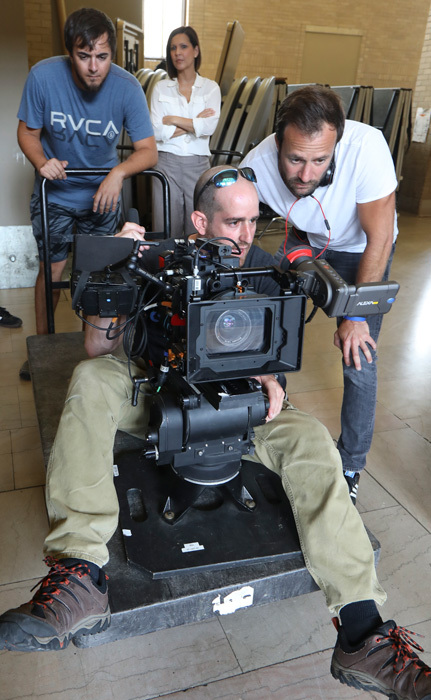 In September, Steph Scupham, film & media manager of the KC Film Office, visited the filming of Big Muddy, directed by Matt Shapira (right), inside Union Station. Photo by Jim Barcus. Revived Kansas City Film Office is attracting films – and funds – to KC. Could Kansas City become a major league moviemaking mecca like Austin, Tex.? For years that’s been the dream of many in the local film community. It’s a vision of multiple big-league feature films that will lure stars and filmmakers away from Tinseltown and here to the City of Fountains. But it’s probably not going to happen. Because after more than a decade in the cinematic doldrums, KC is back in the production business in a modest, manageable, profitable and sustainable way. Steph Scupham, head of the Kansas City Film Office, which came back to life in late 2014 after more than a decade in limbo, is placing her bets on not only attracting one or two big-profile productions to town every year, but on a steady stream of TV shows, commercials, music videos, educational and industrial projects, and shorts that pump a steady stream of dollars — conservatively estimated at $120 million annually — into the local economy. So far it’s working. And the effort has attracted a couple of independent features to our town. Two were shot here in August. Different Flowers is a comedy/drama about a new bride who gets last-minute cold feet and runs off with her sister to get her act together on grandma’s farm. Its writer/director is Morgan Dameron, a former Northland resident who has been the right-hand assistant to director J.J. Abrams of Star Wars fame. One of her cast members is comedy icon Shelley Long (Cheers), who also serves as a producer. Things were a bit different with All Creatures Here Below, written by and starring Overland Park native David Dastmalchian. It’s a road trip flick about a Los Angeles couple on the run, and initially only a few scenes were to be shot here. But Scupham pitched the idea that the region had so many never-filmed environments that the movie could recreate a cross-county trek using just Kansas City locations. In the end only a few scenes were shot in L.A. The bulk of the movie was made here. For 12 years — from 2002 to 2014 — Kansas City was without a professionally staffed effort to run interference for production companies considering shooting here. Back in the glory days of the 1990s the Kansas City Film Office was on a roll. Every couple of years a fairly big Hollywood or indie production came to town. Among the high profile productions were Mr. and Mrs. Bridge (starring real-life couple Paul Newman and Joanne Woodward); Article 99, a black comedy set in a V.A. hospital and oozing star power (Ray Liotta, Kiefer Sutherland, Forest Whitaker, Lea Thompson, John Mahoney, Keith David, Eli Wallach, Jeffrey Tambor); Robert Altman’s jazz-steeped Kansas City (Jennifer Jason Leigh, Harry Belafonte, Miranda Richardson, Dermot Mulroney, Steve Buscemi); and Ang Lee’s Civil War drama Ride With the Devil, which with a budget of around $35 million remains the most expensive movie ever filmed locally. But then production slowed down. Mayor Emanuel Cleaver — a big supporter of the Film Office — was replaced by Kay Waldo Barnes, who was less intrigued by local film production. With no big-profile movies being shot locally, some questioned the need for a film office. As one councilman said of the city budget that eliminated funding for the Film Office, it’s hard to justify a city agency that caters to Hollywood when there’s not enough money to help pregnant teens and the mentally ill.
With its city funding gone, the Film Office became a volunteer effort. Members of the Kansas City Film Commission — mostly individuals who work in film production —donated their own time to handle inquiries from out-of-town producers. But it was a hit-and-miss approach. “There was a lot of work to do with none of the tools we needed,” recalled Heather Laird, a local casting director and long-time Film Commission member. Things began looking up with the election of Sly James as mayor in 2011. James called for a task force on the arts, and the film community responded with a survey that showed the potential economic impact from TV, film and commercial production. The emphasis of the new Film Office, said Councilman Scott Taylor, is on day-in-day-out production. Big feature movies get lots of publicity, he said, but a steady stream of smaller projects provides a more reliable economic impact. The revived Film Office also benefits from changes in structure. It is no longer a municipal operation relying on the line item funding that makes it vulnerable every time a new city budget is debated. Instead, the Film Office has been folded into Visit KC (formerly the Convention and Visitor’s Bureau), a non-profit funded in part by a stipend from the city. This spring the City Council doubled down on film and TV production by approving financial incentives. Many states offer tax credits to production companies that bring in jobs and spending, but Missouri’s film incentive ended in 2013 and has not been reinstated. Now KC has a $75,000 film production rebate program — in fact it is the only municipality in the country to offer a local film incentive without a state-sponsored one. Of the initial $75,000, $60,000 has been allocated to All Creatures Here Below. According to Scupham it’s not so much the amount of the available rebates that matters as the fact that they exist at all. “When we set up our booth at the annual AFCI Locations Show, the first thing we’re asked is ‘Do you offer incentives?’” Scupham says. “If you answer ‘No,’ that pretty much ends the conversation. At the heart of the effort is Scupham, who has earned raves for her enthusiasm, energy and insights. Indeed, Scupham is a self-described “film geek” who has worked on a score of regionally-made films (including Kevin Willmott’s Sundance hit CSA: The Confederate States of America and Ang Lee’s Ride With the Devil). She’s been a talent agent, and has covered KU basketball and created the “comedy cooking show” Guided by Flavor for Sunflower Cable. Filmmakers can work in Kansas City with minimal red tape and without having to obtain location permits. Of special importance: It’s relatively cheap/economical to film here. In recent months there has been a flurry of inquiries about filming at KCI’s unoccupied Terminal A.
KC even has special talents not found elsewhere. KC Studio and KCPT have teamed up to cover the arts more fully. For more about the reinvigorated Kansas City Film Office, visit Flatlandkc.org, KCPT’s digital magazine, on Nov. 21.